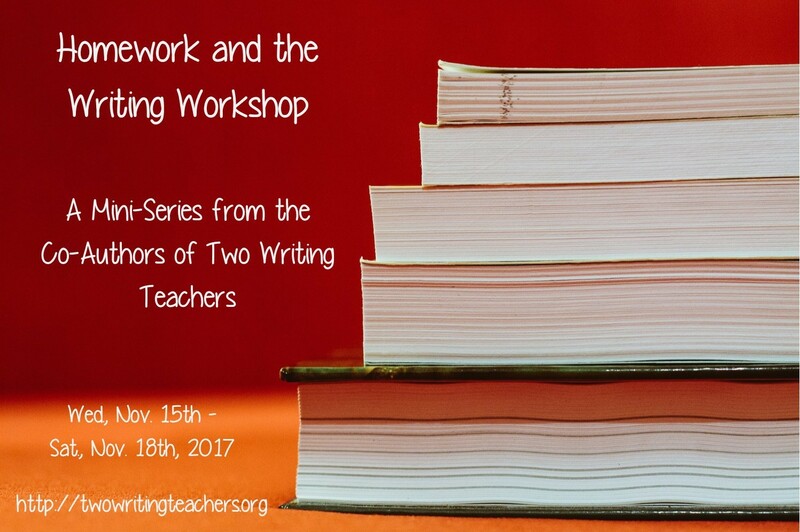 This week, four of the TWT co-authors are taking on homework. As a team, we’ve done a lot of thinking about the idea of homework in both elementary and middle school classrooms. These blog posts represent our latest thinking about homework. When I taught kindergarten, I used to create a packet of worksheets for students to complete each week for homework. If a student came to school without her homework packet completed on Friday, I would make that student sit out of Center Time to finish the missing homework. Of this, I am not proud. At the time, I thought I was doing the right thing. I thought I was teaching responsibility and work ethic. I thought it was important to reinforce the concepts learned at home with worksheets. Now I shudder at the idea of punishing a five-year old for not completing homework. Maya Angelou famously said, “Do the best you can until you know better. Then when you know better, do better.” My thinking in many areas of education has shifted through the years, through experience, conversations and reflection. I changed my stance on behavior charts and Class Dojo after being part of professional conversations that pushed me to question my assumptions about “managing” a class. This past summer, I found myself questioning homework why I give it, what it accomplishes and if there might be an alternative. I began by thinking about the term “homework” and what it conjures. For many, I would bet there are feelings of frustration, drudgery, obligation, and boredom. Not exactly the feelings we want to inspire in our students! I thought about the students in my third grade class and if homework had made anyone a better student. My honest feeling was it hadn’t. Some of the research backed up that teacher instinct. In the article, “Does Homework Contribute to Student Success?” by Jo Earp, the author states, “There is strong evidence and general agreement that homework at the primary level has little impact on academic performance…” John Hattie’s research is often cited about the effects of homework, especially for children in elementary school, basically saying homework at that level has very little effect on academic performance and can sometimes lead to negative attitudes towards school. I remembered a student of mine who went to Disney World during the school year. She blogged about her trip each day she was away through our class Kidblog account and would send me messages each morning, asking me to share her writing with the class. We were able to read about her trip and write comments to her. This student was certainly not assigned homework to complete while away- she blogged about her trip because it mattered to her and she had an authentic audience to read about her adventures. This self-selected writing was purpose-driven and far more meaningful than any worksheet I might have asked her to complete or journal I required her to keep for a grade. I thought of my son, now a first grader. After all day at school, he is never happy to come to the table to work on his homework. But on his own, he will choose to write and illustrate books, create inventions, build forts, create a business selling paper airplanes, etc. He will ask me to look up questions he is wondering about on the computer. I thought of other stories I’ve heard about kids and homework. A friend has said her daughter never gets any time to practice her musical instrument because she has so much homework to do each day. Her reading often gets pushed to the side because there is no time to read after all the written assignments are done. I thought of parents who come home after a long day and first have to start with homework while preparing dinner, or trying to squeeze homework in between bringing kids to after school activities and sports. I thought of some of my students who don’t have a parent at home to help with homework, who might stay with a grandparent or siblings, where language and even lack of school supplies can be a barrier to completing work after school hours. I thought of all the time spent assigning and preparing homework, having students copy down their homework in the planner, signing the planners to make sure it was copied appropriately, collecting it, checking it, making phone calls for all the children not completing it….so much time. Was the time spent equal to the benefit of homework? Was assigning homework the best way to reinforce concepts and excite students to continue learning when the school day ends? My heart told me something needed to change. As I considered this shift, I had one major worry: How would I communicate what we are learning in class to parents if they are not seeing homework each day? Homework has often been that bridge between school and home. With new technology, could I share what we are learning without sending home daily homework? Here are some ways I’ve tried to share information with parents about what our class is learning. SeeSaw: SeeSaw is a way for students to keep digital portfolios and for parents to see what their child is learning. Students can add items to their portfolio and parents receive notifications when they do. The teacher can also send announcements and reminders, similar to the app Remind. I’ve started sharing information with parents via the student journal as well. Here is an example of an entry I added to every student journal so parents could understand our recent lesson in the personal essay unit. Click the picture to view this on the SeeSaw app and listen to the audio that parents in my class can hear when they open the item. This is an easy way to share information with parents. Class Website: My class website is another way parents can see what we are learning. I include the links to our current newsletters and try to update each area of the curriculum with resources. I remember the first time I heard the phrase “pre-owned” on the radio. It was amazing how different that sounded than “used” when car shopping. A pre-owned car painted a very different picture in my mind that a used car. When thinking about continuing the learning after school, I wanted my students to feel excited about the possibilities, not locked into a dull task that felt like “work.” Maybe it was semantics, but I wanted a new name for the options students could have to enrich their learning. I decided on “Home Learning Opportunities” because that closely matched how I see the menu of choices I’m providing each month. I offer this to students and their families as possibilities and opportunities- this is not required work and I do not collect anything. If students want to share with me something they worked on, I am over-the-moon-excited to see what they came up with, but they are not obligated to do any or all of this work. The menus reflect all subject areas but each menu includes authentic writing opportunities, such as blogging, writing poetry, being inspired to write in the style of a mentor text and creating cards for people. I create a menu each month and tailor it to the season and the curriculum we are studying. I know homework can be a hot-button issue and educators have different feelings about the benefits of homework. I am 3 months into my first year of this shift in assigning homework. In some ways, it puts more pressure on me to make sure I am communicating our learning to families. I try to create menus of learning each month that include a mix of digital and non-digital possibilities. This has pushed me to use technology in new ways and rethink home/school communication. I love the instructional time I’ve gotten back from not assigning homework and I like how my relationships with students are more positive since I’m not interrogating them on why their homework wasn’t completed. TWT will continue exploring the issue of homework this week, with posts from Stacey, Lanny, and Melanie. We hope you join the conversation and share your ideas around homework. Kathleen, I find myself sharing this post with someone new nearly every day. Thank you. I truly love your reimagined homework. Thank you for sharing the examples of home learning opportunities. As you know from our Voxer conversations, I adore the way you’ve reimagined homework for your students. I appreciate you including each month’s learning opportunities so we can be inspired by the work you’ve begun to do to transform what home practice and home learning looks like. Thank you Stacey! Off to leave a comment on your post today. I LOVE the homework text set you curated. What a great write-up and wonderful ideas especially the Seesaw portfolios and Twitter! I started a no homework policy in my class a few years ago and last year I ran a study group for teachers in my school around the book Rethinking Homework. Next Monday our district is bringing together a committee to rethink how/if/why we assign homework…I am hoping for big changes and I will certainly share your article! Hi Mary! I love that you ran a study group around the book Rethinking Homework! (Oops- seems I borrowed that title without realizing there is a book already with it!) I think a study group is so wise. It’s not threatening and allows teachers to read, think, reflect. Homework is something that some teachers feel very strongly about- both ways. I know teachers who believe homework is essential and think it is unwise to stop assigning it. In the end, we all do what we think is best for our students. But talking together might help some change their minds or move to a different mindset regarding homework. Please let me know how the teachers you work with respond to this post! Kathleen, this post is amazing! I have, over the past couple of years, cut down homework, mostly because of the frustration of Ss not doing it and the time I spend creating it. I long ago gave up on worksheets, but nothing I do seems to spark any interest. But, around this time I begin to get that panicky feeling that Ss aren’t making progress and need more practice. And I start sending some homework now and then; as the panic increases, the worksheets creep in. But the results don’t change. Those who do it, do it, and those who don’t, don’t. I love your ideas and plan to take a breath, relax, and implement some of your work. Thanks so much for sharing and inspiring so many with your wisdom. Thank you Fran for your comment! I totally understand that panic you are talking about. And I agree with you about some do it and others don’t. I think as my understanding has developed about culture, families, inequities, and learning, I’ve come to see that punishing children for circumstances they can’t control is not the way to help them improve academically…..and it just feels wrong. Letting go of controlling what my students do after school has been so incredibly freeing and it also allows me to focus on inspiring them to WANT to continue learning, not to feel it is something they are forced to do then scolded for not doing. Please let me know how it goes if you try out the ideas shared here. I really appreciate your voice in this conversation. Great entry here. Are you familiar with the work of http://www.teachersgoinggradeless.com? #tg2chat. A lot of your focus on communication and portfolios is key to that movements as well. Thanks for confirming so much of what I see in my own children, and so much of what I want/long for for them. Thank you for sharing that resource with me and the TWT community. I’ve had some conversations with Peter Anderson regarding going graceless and he pointed me in the direction of the family dialogue journal. I agree that communication and portfolios help families understand the learning so much better than homework sheets or number grades. Looking forward to exploring the site you shared. Thank you so much for your comment. Kathleen, my day is always brighter when you share your powerful thoughts. Like you I’ve made changes to my homework viewpoint over the years. This is a new path that I’m forging and I can see areas of growth for myself still to come as I am challenged to balance my standpoint and the school/grade level requirements. AND, I love, love, love your hook lesson. One of my writers mentioned hooks yesterday, opening the door to this important topic. I know what my next lesson will be. THANK YOU for sharing! Nikki, thank you for such a beautiful comment! That means so much to me. I hear you about the school requirements. I was only able to take the leap because my principal felt the research showed homework did not impact student achievement. Without her blessing, I wouldn’t have felt comfortable to adapt my policy. I’m so glad you like the hook lesson! Let m know how it goes with your students. Thank you for your comment- I really appreciated it. Thank you for such a wonderful post. I absolutely love your idea of “home opportunities for learning”, such creative, outside-the-box ideas that are fun and kids will learn! Thank you Tracy! I appreciate your comment and feedback! Good for you, Kathleen!!!! I did the exact same thing a few years ago and I can tell you what a huge relief it was for families. I love that you have backed your position up with research too. I wish every teacher would read this and really examine their practice. Best practices change. We need to do the same. Hi Jennifer! Thank you for your support and validation. I totally agree that we have to read, reflect and adapt as times change and practices too. Thanks so much for joining the conversation, Stephanie! It’s amazing how scheduled kids are and the myriad of activities they might partake in after school hours. I’ve shifted my thinking to not necessarily think kids need to spend more time on schoolwork at home after a long day at school. I think time to read is vital. And beyond that, time to play a board game or cook with a family member might be just as valuable as a math worksheet I could give. Time to make a card for a relative or even write your own book….I think we all need a chance to step away from work each day, even kids. I’m grateful you are sharing the post with your grade level because I think it opens up conversations, even if people don’t necessarily agree with everything I suggested. I’m so glad you are willing to share the post and engage in conversations about the role homework can/should play for students. Hi Erika! Does your school create a weekly menu? Do you have to create it? Do parents really want homework or have they been open to change? So glad you are part of the conversation!